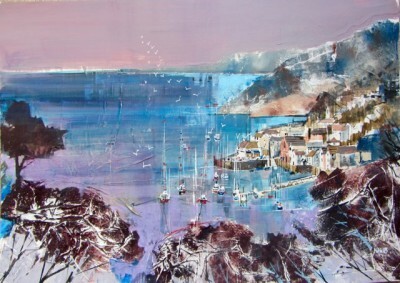 Right now we are waiting for new Nagib KARSAN Seascape Art to arrive at the gallery. In the meantime, here is a wider selection of the artist's work featured at the Red Rag British Gallery. Nagib Karsan was born in Tanzania in 1955. He spent his early life in Africa and at boarding school in the UK. An enjoyment and talent for art resulted in Nagib undertaking an art course in Kenya before embarking on a varied career in business. The 1990's brought a less hectic lifestyle and the time to rediscover his interest in art. 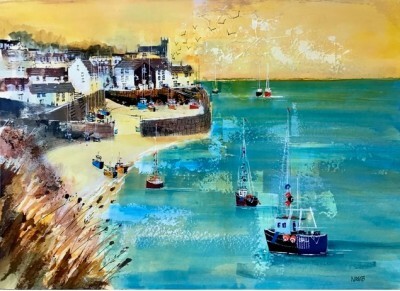 Nagib is now painting regularly and uses an unusual technique of applying a collage of printed cut paper to the surface before and during the application of paint. This often creates random and unexpected results which are full of interesting textural qualities and enduring appeal. Nagib's art style is loose and fluid. 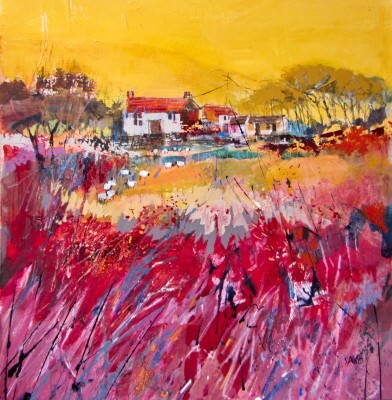 His paintings have a strong sense of life and immediacy. Karsan finds particular inspiration in the work of Frank Webb. 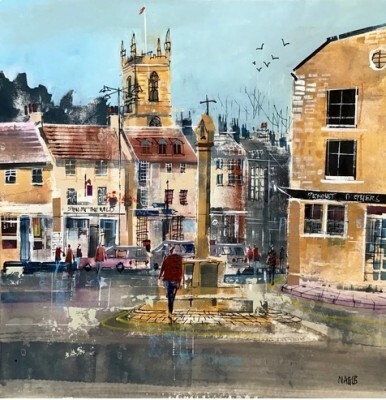 Webb is known for his use of colour in his vibrant watercolour paintings and his influence on Nagib's approach to contemporary paintings is evident. 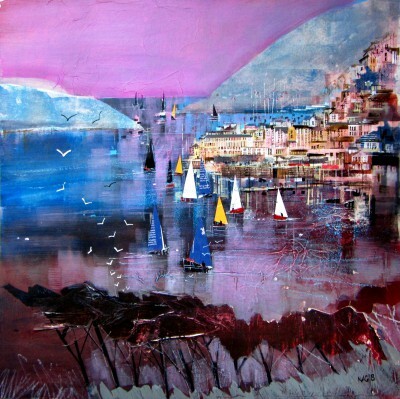 Karsan's paintings are colourful and uplifting, capturing the feeling of a place. Karsan travels extensively in search of interesting vistas. 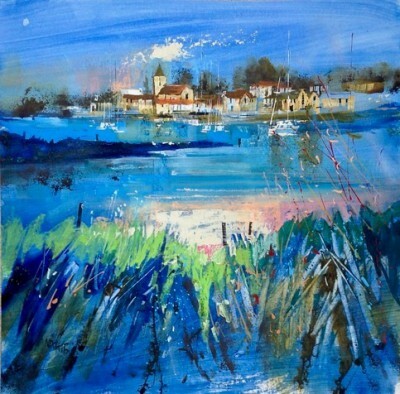 Nagib has found inspiration in the harbours and towns of the West Country and in Venice. His paintings are the result of careful study and observation. 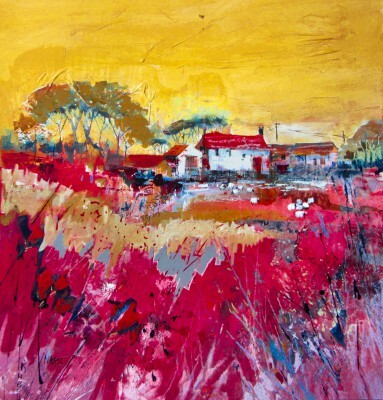 Within his paintings he successfully combines textural content whilst capturing the ever changing light of the landscape. Nagib Karsan is a member of several British art societies and his art work can be found at various British art galleries. Each painting at Red Rag is sourced from the Nagib Karsan artist studio and like all Red Rag British art and Contemporary art it can be shipped worldwide. As the leading name for British Art Red Rag aims to offer a broad portfolio of contemporary art from Nagib Karsan. The breadth of the Red Rag British art collection is extensive and the gallery is always happy to help source specific art pieces for customers. To discuss requirements for specific Nagib Karsan art work customers should contact the gallery on the telephone number below. 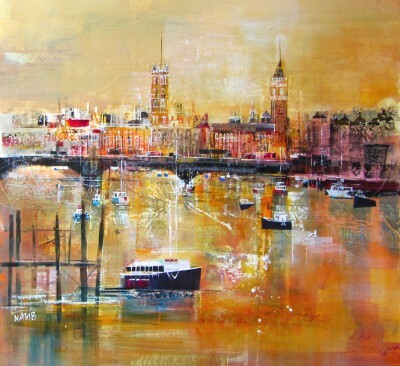 Throughout the year Red Rag Gallery promotes the art work of Nagib Karsan and other present day British artists. New art work from Nagib Karsan is regularly available and shown at the gallery. To receive information about new art works from Nagib Karsan register for updates on the link below. 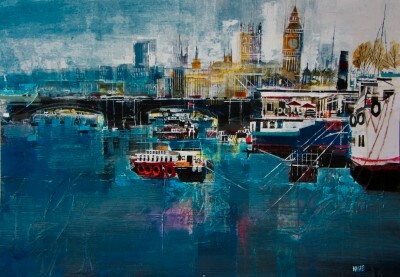 British art works at Red Rag Gallery by Nagib Karsan can be viewed on-line or at our high street galleries. All available art works by Nagib Karsan can be viewed at Red Rag Gallery seven days a week from 10:00 each day. The website is updated daily, but customers planning to visit Red Rag to see art work by Nagib Karsan are advised to contact the gallery beforehand to check on the availability of specific art pieces. The information and images about Nagib Karsan and Nagib Karsan artworks on the Red Rag British Art Gallery website should not be reproduced or copied without prior consent.